After many months of work through the last year, I present you my new supercar: a Land-Rover Deffender (110 version). Yes, for me it is a supercar, it is not a truck trial or a normal 4x4. Yes, I know, it is very high and square, but it has many advanced features and solutions, and for me it is enought to call it supercar. Note: The number with the name means the wheelbase in inches, 110 in this case, it is the most used. But nowadays exist 90, 110 and 130 versions. When I was a child, in my town, everyone used a Land-Rover Defender (usually very old) to go to the countryside, mainly for the agriculture. It's a extraordinary cross-country car and nearly indestructible. That's the reason why it's very used all around the world. Since then, I am a Land-Rover Defender fan (nowadays, I have two of them to use in my family's farm). I tried to built it some years ago, but with the parts avaiable in that moment it wasn't possible...(because of the wheels mainly). 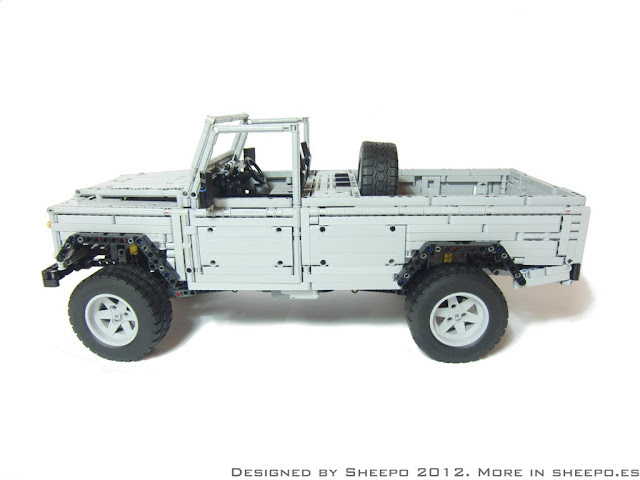 But, with the new Unimog tires was the perfect moment to built it definetly. This model is made in 1:8.4 scale, thus remains in 28 studs wide, 65 of length and 29 of high (without roof). It have 5+R speeds secuential gearbox, with auto clutch. The mechanism disconnect the clutch, change the speed and connect it again, pushing only once the controller. I know this is not realistic, but I you want to control the gearbox remotely, this is the only way to do it. It has front and rear live axles with long-travel suspension. Complete interior with working steering wheel(3.6 laps, as the original Defender) and gearbox speed indicator. Of course the 4-cylinder fake engine moves with the drive motors. 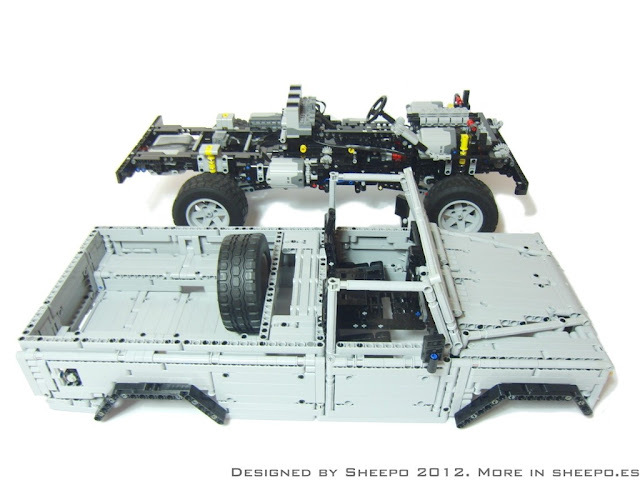 The steering system is based in the real live axles system, it not uses the typical rack. It has disc brakes in all wheels. They are very powerfull, enought to stop the transmision. Also you can disasembly the bodywork removing only 4 pins and the steering wheel, do it is very fast. With the bodywork removed, you can remove 5 more pins and take out the complete powertrain. Que guapo está, esto es lo que quería ver yo, y me ha gustado mucho mas de lo que esperaba!! Is there a chance to post a simple instructions for this gearbox? I know you did instructions for Mini's gearbox, but this one looks much better! but in the video or the pictures you can't see a roof??? Best 4x4 ever in Technic... and It is a Land Rover. Congrats for such Creation Sheepo. Put it out on Cuusoo, NOW! does the separated powertrain includes the sequential gearbox?? I hope there come a set of it!!!! And than I buy them. With many patience and imagination hahaha, all my cars are designed with that system. In a technic creation you can't use digital programs because you can't know if the connections and structure will be enough strong and reliable. Please Please post instructions for this! Ditto - just voted for this on Cuusoo. Absolutely awesome... I cannot believe the detail/accuracy/scale, and the engineering is incredible. I'd part with a few hundred notes for this model! Please list parts/instructions!! Great job, but all Defs are AWD, only Series were RWD/AWD. This is an awesome project, well done! and how mucht does that cost? And if you couldn't buy it. Please, send the instructions to this e-mail. simply amazing sheepo!! job incredibly well done - I certainly hope things on cuusoo.com workout so we can get this made into a set!! I'm trying to make something equally impressive myself, but damn - you sure set the bar REALLY HIGH!! are there downloadable instructions anywhere?? I really want to see detail on your 'traction mode' and the transfer-case...as well as the super compact 5-speed transmission-shifting device!! SOOOOOOOOOOOO AWESOME!! 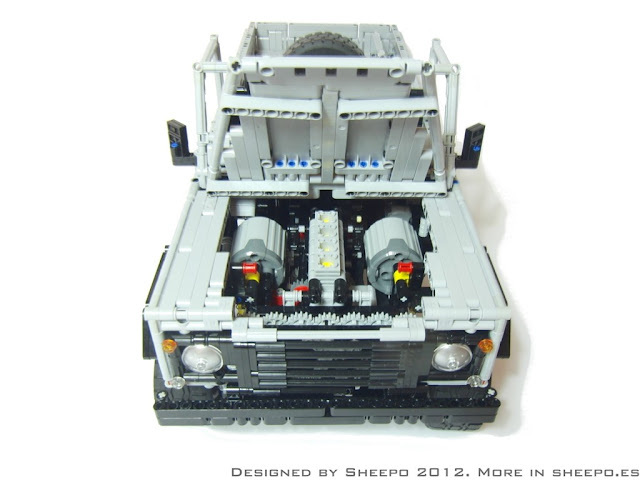 Best Technic MOC I've ever seen, I've voted at cuusoo.com. I want one............would look good next to the Unimog. Espectacular... He posteado tus enlaces en los foros de la Legion Land Rover Colombia y en el Land Rover Club Argentina... Un grano de arena para lograr los 10000 votos... Mucha suerte. Please put the instructions for the gearbox! I say, vote and buy! Please post the gearbox instructions or more detailed photos. I would pay for the complete instructions! I know it may be conflictual with Cuusoo, but I don't think Lego would make it a real set (they should but it would be too expensive to attract lots of people). WOW !!! DONDE PUEDO COMPRAR UNO ASI ??? CUANTO CUESTA ? Sei davvero un genio, complimenti!!! this moc weighs over 3000 grams, has 9cm wheels, is driven by two XL motors and has a 1:1.67 gear ratio in 5th gear in the high range. 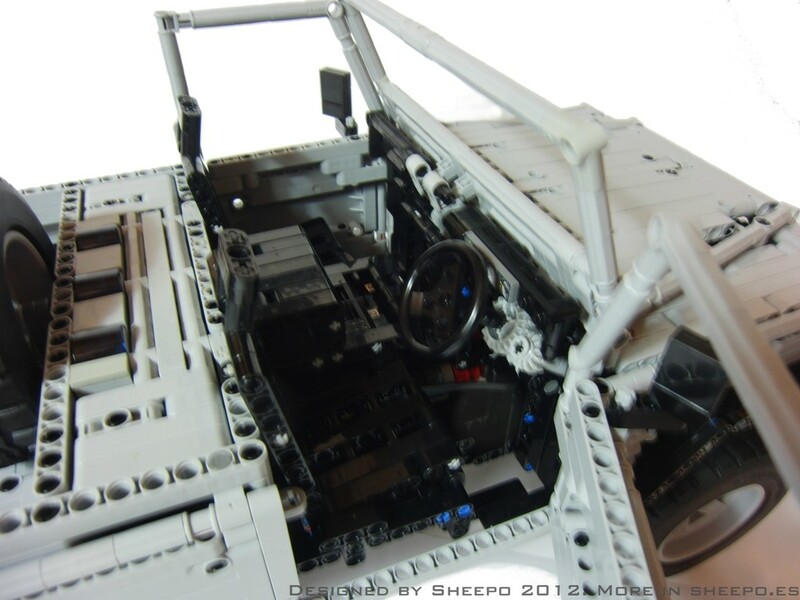 i am working on a supercar that currently weighs less than 1000 grams, has 6cm wheels, has a 1:1.19 gear ratio in 6th gear and is also driven by two XL motors, yet the motors in this car seem fine when driving off-road, and the motors in my moc seem to be always strained even when driving on smooth floorboards. how did you do this? Why dont you sell it yourself? Put every piece in sorted bags, seal it, print the instructions and sell it.. Lego does not have to make this creature official. awesome!! May I ask about eventual commercialization of this ''car''!? It's a very muscular looking car and I bet it can navigate any kind of terrain. Cool! Really Great Work! I also would be willing to pay for the Instructions/Part List! Is there anyway I can get you to build one for me (gift for my dad?). I dont think I can wait for LEGO... this is too genius to keep unmade. BRILLIANT work sir. Superb creation, Sheepo - my 11 year old son Matt thinks its the best thing he has ever seen! Best wishes from Lancashire, England - keep up the great work! That is probably the best LEGO thing I´ve seen - unbelievable. Where to put my email adress for the instructions as soon as they're ready? May I hope one day you will publish the complete set of instructions? Hola Sheepo.Me encantan los MODs que creas,son muy buenos.Espero que saques las instrucciones de este modelo,que me gusta y me encantaría montarlo.Un saludo a Sheepo y a todos. 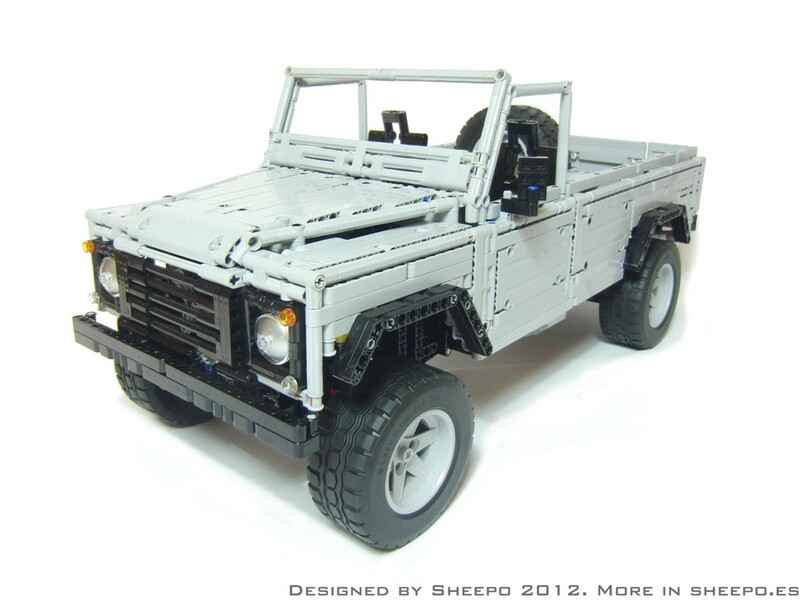 Sheepo, I would be well willing to pay for the full instructions of your incredible Land Rover. I know it must be very difficult to document the full MOC, but if you have the time, could you please post a instructions as well as a part list for the basic functioning structure, including the gearbox and various motors, but not necessarily with the land rover bodywork. I know it must be extremely difficult, but many members of the community would really appreciate it. its just a great car! 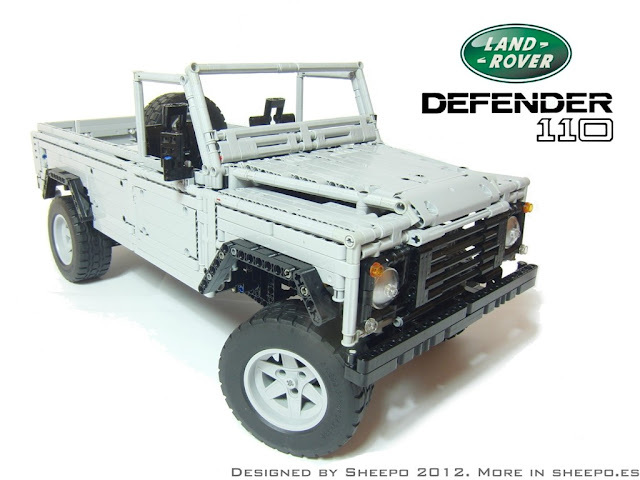 I sell this cars in Switzerland and my son is a great Defender fan. has 2 Landys with remote control. Am I right, that if I post a message here, you'redeleting that one as well? I don't do that, I just delete messages that have inappropriate words, or questions have already been answered before above. Could you post some detail pictures of the gearbox of the LR110? It seems so much better in size than the PDK and Veyron one. Here in Portugal, we really hope it could be a reallity LEGO kit. Hi there Sheepo. Like the the model, in LEGO of all things. I am an avid LR fan, owned many in my time. The LR 90, 110, 130 range is fulltime 4x4, with a lockable differential in the centre transmission. When I have some money I may buy some instructions, for the LR 90 as I owned one (Converted to V8 auto). hi there, i have bought the intructions and en finished it yesterday, i love how it works and how it looks, but i have one question, how have you managed the wiring around the transmission, because the wiring stops the transmission from working. 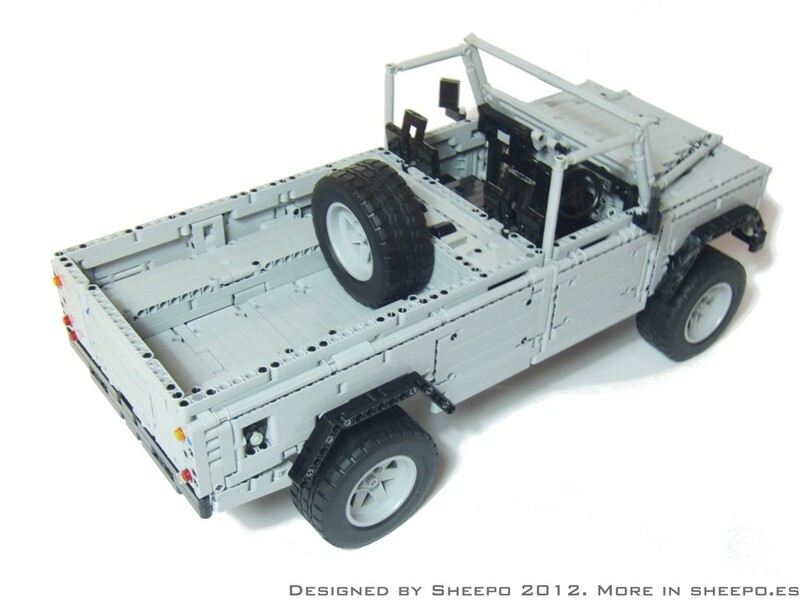 just to have an idea, what is the approx price of all the parts to build this land rover ? Hi Sheepo, i start today with building it´s a cool Model. thanks for the fast work to send the list´s. 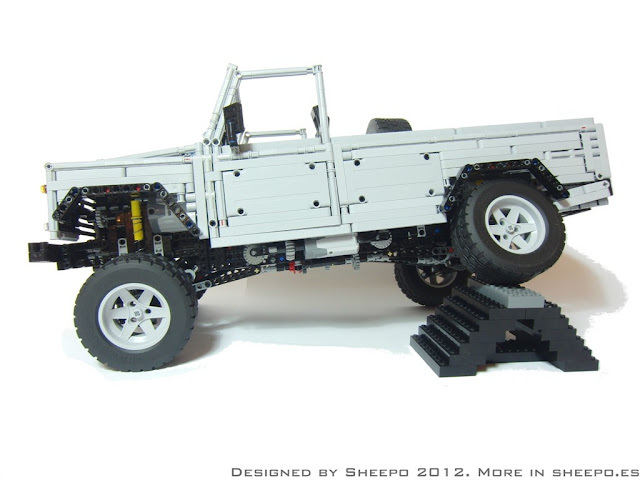 Ho Sheepo, could you provide some pics of the rear axle, also, does it use ball joints? No, I can't. And yes, it uses some ball joints. Sheepo, do you use rechargable batteries for your models? If yes, what type do you use and how much mA do they have? I am looking for an alternative to comparable expensive batteries. Lego does not recommend anything regarding their PF motors besides their special PF-accu-block. I use normal alkaline batteries, they are expensive but the motors works better and with more power than rechargable batteries. Hi, my best friend's dad has a Land Rover pick up, single cab, like yours! But his one has a closed roof and is white, could yours be made to also have a roof? Thank you! What a car! Truly land rover is not just a car..it's a royal vehicle! What was the real reason LEGO didn't make it an official set? Are they not good enough to understand the concept we want realistic model cars?! I don't have any "official" reason about why they didn't release it :(, probably it is too complex to be reliable and with low sales expectations. hi is that okay if i put more of that motors to run faster? Is it possible to shift the gears while driving? Great MOC !! I am now building it !! So far no problems with the axles and chassis !! I will try an extra choc in the rear so i can ad a roof !! Best Technic model ever !! Hello, what exact motors have you used?? Would a v8 style engine mock up fit between the drive motors? Hey Fernando hope you are doing well. How did you give camber angle to the front axle? It is so hard to do it with a live axle. Is it because of the wobbling that the axles have in the connector? Unfortunately that camber angle is caused by wobbling as you said. Sheepo I am looking for a gearbox for my Ferrari 250 GTO and I have 2 questions 1. can I adjust the ratios ? on these boxes and which gearbox out of this and the mustangs is A. smaller ? and B. more efficient ? You can change the ratios, but this design is the more efficient possible. The Mustang's gearbos is smaller and more reliabable. can you buy them somewhere? Maaaaaadre mia! Qué currazo de modelo! Debo felicitarte con toda mi alma! Acabo de montar el Bugatti Chiron de Lepin y estoy a la espera de montar el Porsche 911 GT3 RS oficial de lego. Pero ser capaz de haber diseñado, montado de cero y evolucionado un modelo como éste peeeazo Defender con éxito... eso amigo mio, te posiciona en lo más alto de mi lista de ídolos! Qué pasada! ...no me quiero imaginar lo feliz que te haria trabajar en Lego como ingeniero diseñador de modelos Technic, no?